Get year-round comfort in all areas of your home! The LG LMU36CHV is a 34,000 BTU configurable multi-zone mini split air conditioning and heating system. With flexibility to meet your installation requirements, LG's Flex Quad Zone Multi-Split air conditioner lets you install two, three or four indoor units with a combined BTU rating of up to 48,000 BTUs. Focused on efficiency, this mini split system is Energy Star Qualified when used with wall mount or ceiling cassette indoor units. New to this model is an enhanced heating range. This system will operate in the heat mode down to -4°F making this a viable option to be a primary heat source in many different climates. With the addition of the optional drain pan heater, even better heating performance and range can be had. This system combines individual room temperature control with low operating costs. The LMU36CHV can be easily installed without major renovations. Small line sets (sold separately), which only require about a 3” hole, are run from the outdoor unit to each indoor unit. The LMU36CHV outdoor unit offers standard features including a super energy efficient variable speed inverter compressor, defrost/deicing capabilities, three minute restart delay, and a self diagnosis system. It also includes soft start which reduces power surges on the electrical system. It operates when the outside temperature is as low as 14°F in the cooling mode and from -4°F to 64°F in the heating mode. To top it all off, it uses environmentally friendly R-410A refrigerant and is precharged for up to 98’ of line. LG offers ultimate flexibility and configurability in your selection of indoor unit. All indoor units offer a variety of fan speed options and auto restart operation. You can use the dropdown boxes above to customize your system. Need help deciding? Contact us for expert advice. Standard Wall Unit (LMN079HVT, LSN090HSV5, LSN120HSV5, LMN159HVT, LSN180HSV5, LMN249HVT) - The standard wall unit comes in a white finish and will blend quietly and seamlessly into any room decor. It is installed high on a wall. It connects to the outdoor compressor through a small opening in your wall, drilled behind the unit. The line set and wire (required, sold separately) are sent through the opening and connect to the compressor outside. A wireless remote is included for convenient operation from anywhere in the room. These units have built-in WiFi! Available in 7,000, 9,000, 12,000, 15,000, 18,000, and 24,000 BTUs. Art Cool Wall Unit (LAN090HSV5, LAN120HSV5, LAN180HSV5) - The Art Cool wall unit comes in a reflective, smoky black, mirrored finish that will add a modern flare to any decor, while still blending quietly into any room. Like the standard wall unit, it is installed high on a wall and connects to the outdoor compressor through a small opening drilled in your wall, behind the unit. The line set and wire (required, sold separately) connect to the compressor outside through this opening. A wireless remote is included for convenient operation anywhere in the room. These units have built-in WiFi! Available in 9,000, 12,000, and 18,000 BTUs. Art Cool Gallery (LMAN097HVP, LMAN127HVP) - An Art Cool Gallery unit can be a beautiful, non-obtrusive way to get conditioned air into any room of your choice. 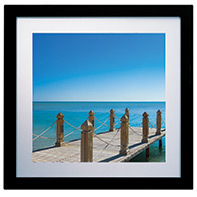 A 2’ x 2’ frame allows you to display a personal piece of artwork (or the included piece). The air is dispersed quietly and efficiently from the edges and bottom of the frame into your room. It is installed on a wall and connects to the outdoor compressor through a small opening drilled in your wall, behind the unit. The line set and wire (required, sold separately) connect to the compressor outside through this opening. A wireless remote is included for easy control. Available in 9,000 or 12,000 BTUs. Ceiling Concealed Low Static Unit (LDN097HV4, LDN127HV4, LDN187HV4)- Low Static Concealed Ceiling units are installed in a ceiling and hidden from view. They require ducting as well as registers. The registers allow the conditioned air to come down into the space. Depending on the size and shape of your space, a concealed unit can be ducted for multiple rooms or one single room. As an example, an 18000 BTU unit will provide comfort control up to about 825 sq. ft. A drain pump is included with this unit. A controller is required to operate each indoor unit. One is not included with the unit. Available controllers include a wired simple controller PREMTC00U, or a wired, touchscreen controller PREMTA000 (each sold separately). Wire required to connect the Indoor unit to the wired controller is not included (PZCWRC1 - sold separately).Available in 9,000, 12,000, and 18,000 BTUs. Ceiling Concealed High Static Unit (LMHN240HV) - High Static Concealed Ceiling units are installed in a ceiling and hidden from view. They require ducting as well as registers to allow the conditioned air to come into the space. Depending on the space you are trying to condition, a high static unit allows for longer duct runs from the unit itself. This way, you can install the unit and duct off into several individual areas, wherever the air is needed. This may be one large space or multiple rooms. The 24,000 BTU unit will provide comfort control up to about 1100 sq. ft. A drain pump is included with this unit. A controller is required to operate each indoor unit. One is not included with the unit. Available controllers include a wired simple controller PREMTC00U, or a wired, touchscreen controller PREMTA000 (each sold separately). Wire required to connect the Indoor unit to the wired controller is not included (PZCWRC1 - sold separately). Ceiling Cassette Unit (LMCN078HV, LCN098HV4, LCN128HV4, and LCN188HV4 - A ceiling cassette installs into the ceiling and offers 4-way airflow into your space. A grille is required on a ceiling unit (standard white grille included) and air is dispersed from all 4 sides of the grille. A ceiling cassette can be installed in the center of a room, allowing airflow all around. Alternatively, it can be installed along the edge of a room, closing off 1 or more "vents" for customized air flow. A drain pump is included with this unit as well as a wireless remote control. Available in 7,000, 9,000, 12,000 and 18,000 BTUs. Vertical Air Handler Unit (VAHU) (LVN180HV4, LVN240HV4) - Vertical Air Handlers are 4-way, multi-position air handlers (LVN180HV4 and LVN240HV4). A multi-position air handler can be installed as an upflow, downflow, horizontal left or horizontal right installation. This allows for attic or basement installations. A vertical air handler may be used as a way of replacing a conventional air handler currently being used as part of a central system. Another possibility may be that you are looking to zone your dwelling with a mini split system regardless of whether you are using existing ductwork or adding new. 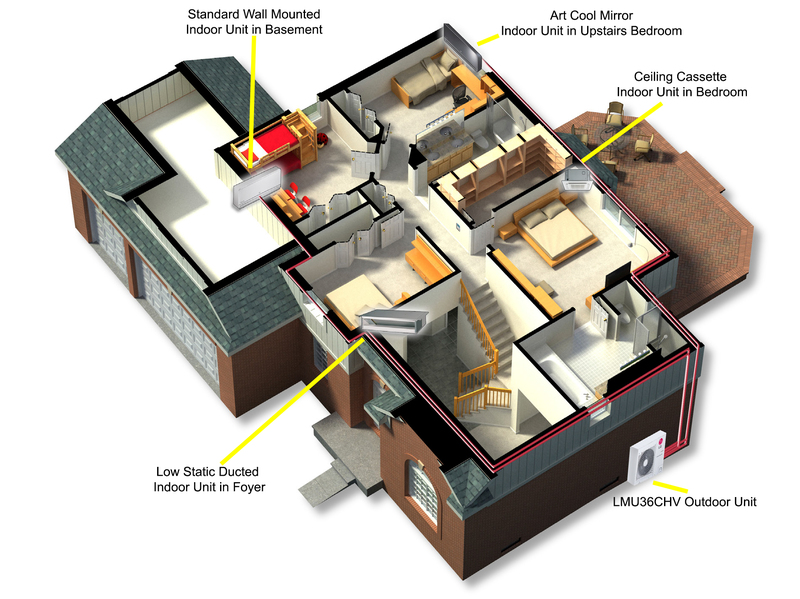 The 18,000 BTU multi-position unit will add comfort control to a space that is about 800 sq. ft. Either of the 24,000 BTU units can be ducted units into several rooms totaling about 1100 sq ft. All units will heat and cool your space both appropriately and efficiently. Regardless of the number of spaces you are cooling/heating, a wall mounted thermostat will control that zone. A controller is required to operate each indoor unit. One is not included with the unit. Available controllers include a wired simple controller PREMTC00U, or a wired, touchscreen controller PREMTA000 (each sold separately). Wire required to connect the Indoor unit to the wired controller is not included (PZCWRC1 - sold separately). The LMU36CHV can be used with 2-4 indoor units. Above, is an example of a four zone layout. We are an LG Authorized Online Distributor. We are also the only online seller to have an LG Technical Service Advisor on staff. Whether you have pre-sales questions or you need support after your order, we are here for you. We are an LG Authorized Parts Distributor meaning any warranty parts requests are processed quickly and easily.